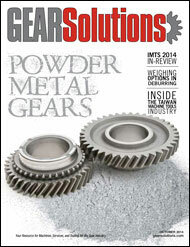 Powder Metallurgy is a proven technology to produce high strength gears for the automotive industry. 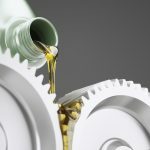 Advances in powder production, compaction, and sintering combined with double pressing have enabled overall part densities up to 7.5 g/cm³ in spur gears. However, helical gears are more difficult to produce to these same densities because the geometry does not lend itself to the DP/DS process. Described in this paper is a P/M parts making technology capable of producing single pressed and sintered helical gears with core densities approaching 7.4 g/cm. Description of a prototype run will be presented with the resulting sintered part densities and part-to-part variability. To further enhance the performance and geometry of these helical gears, they were subsequently surface densified via rolling. Improvements in the surface density and gear quality will be described. (P/M) techniques have proven successful in displacing many components within the automobile drive train such as: connecting rods, carriers, main bearing caps, etc. The reason for P/M’s success is its ability to offer the design engineer the required mechanical properties with reduced component cost. 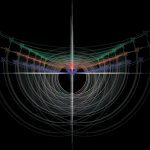 At the present time, P/M is successful in two primary performance areas. The first is in density ranges below 7.1 g/cm. with low to medium strength requirements. The second main application area is fully dense P/M via powder forging. Here a sintered preform is hot forged to near pore free density, maximizing the mechanical properties of the P/M component. To close the gap between conventional P/M and full density P/F, a process is needed that enables the P/M parts producers to manufacture parts with sintered densities > 95% of pore free via single press / single sinter processing. This higher density provides enhanced mechanical properties with a higher elastic modulus. Although high density provides better mechanical properties such as tensile properties, fatigue, and impact toughness, even minor amounts of surface porosity can have a significant negative effect on certain characteristics. In particular, high performance gears requiring full density in the critical stress region to withstand the high Hertzian contact stresses. 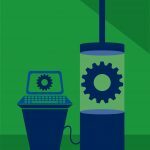 Secondary processing, such as surface densification, enables the production of a highly engineered porous core component with full or near full density in the critical stress region of the gear. What is needed is to merge the practice of surface densification with higher core densities to expand the potential applications for P/M. An example of a part family that offers significant volume opportunities for the P/M industry are helical gears used in the planetary gear sets of automatic transmissions. The requirements of these gears are high surface hardness, good core toughness, fatigue strength for tooth bending, rolling contact fatigue resistance, and high density to resist pitting and sub-surface spalling during service. Currently, these gears are machined from either AISI 8620 steel or AISI 5120 steel carburized and machined to meet the dimensional specifications. Conventional press and sinter technologies offer low production cost to produce these parts; however the corresponding mechanical properties are inadequate. Powder forging a blank and then machining will give the required mechanical properties but at a cost that is prohibitive. It is speculated that a technology enabling core densities > 7.4 g/cm. with a fully dense surface will meet the mechanical property requirements of this application, yet be economically competitive (see Table 1). 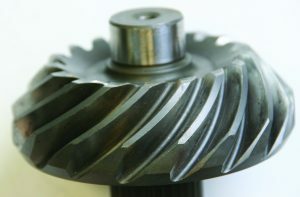 In an effort to satisfy the diverse mechanical requirements of these helical pinion gears, Capstan Atlantic and Hoeganaes Corporation collaborated on the implementation of a new compaction technology, AncorMax, which enables the attainment of high core densities without the need to preheat the powder. The advantage of this process is its greater flexibility in the manufacture of high-density P/M parts. It will be demonstrated that this process can produce helical gears with sintered densities approaching 7.4 g/cm.. Following compaction and sintering, Capstan employed its proprietary surface densification technology to densify the high stressed region of the gear. 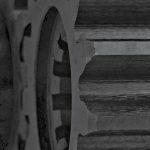 This technology coupled with the attainment of the proper heat-treated microstructure can produce gears that approach the performance of wrought steel gears steels. The rotating bending fatigue data (rbf) presented in Table 2 demonstrates the same beneficial effect of increasing density on the fatigue survival limits. The 0.10 g/cm³ increase in density yields approximately a 10% increase in fatigue life. To verify the production capability of the AncorMax D process Capstan Atlantic and Hoeganaes Corporation collaborated in the compaction and sintering of the helical gear shown in Figure 4. During this effort, a standard premix material consisting of FLN2-4405 composition (Table 1) was compacted as a reference at pressures ranging from 550 to 830 MPa (40 tsi to 60 tsi) in non-heated tools at a press speed of ~ 8 strokes per minute. 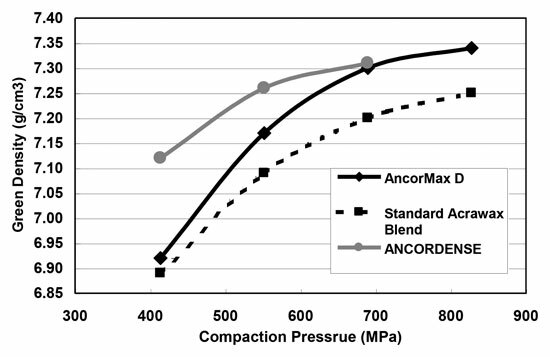 Phase two of the trial involved compaction of an AncorMax premix of the same FLN2-4405 composition (with the exception of the lubricant addition and type) utilizing the same helical gear tooling. 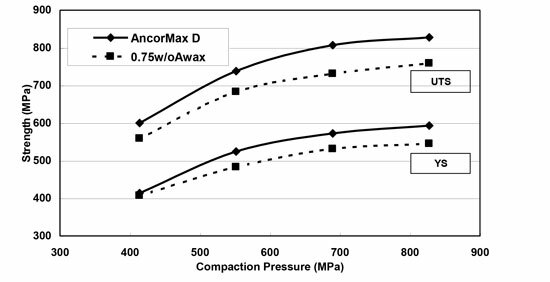 Compaction pressures of 550 MPa to 830 MPa (40 to 60 tsi) were utilized with a die temperature of 65°C (150°F). 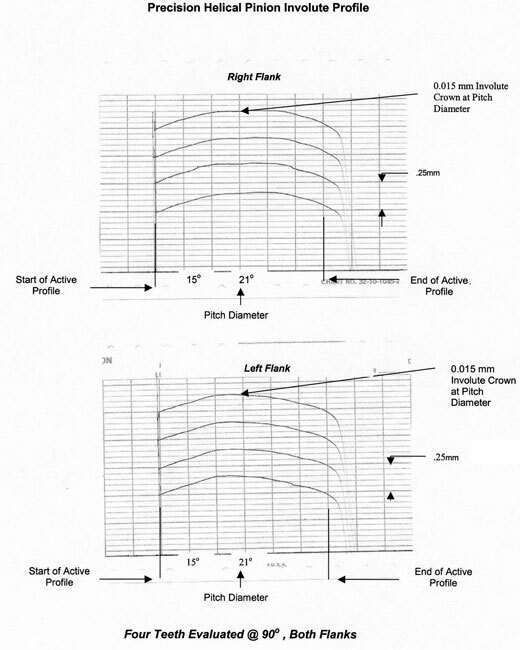 In both compaction trials, the part height was varied from 6-mm (0.25-in.) up to approximately 25-mm (1.0- inch). 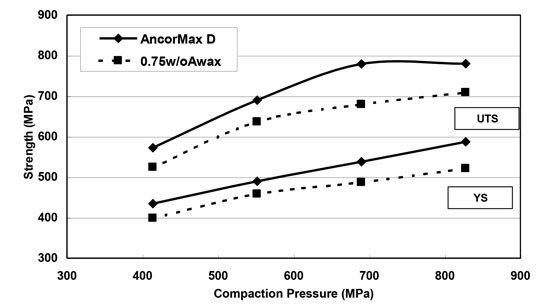 Part-to-part weight variability of the gears produced with the AncorMax D process showed reduced scatter relative to the standard material (Table 4). This reduced scatter will lead to reduced dimensional variation in the production of the actual component. After compaction, the gears were sintered at 1120°C (2050°F) in 90-v/o nitrogen and 10-v/o hydrogen sintering atmosphere for approximately 30 minutes at temperature. The sintered gears were evaluated for sintered density; the results are presented in Table 5. More than 3000 gears were compacted during this pre-production effort. Twelve sectional densities were evaluated via sectioning a part into 4 quadrants around the diameter and into three height regions. The result of this analysis is shown in %%1014_Cap_Tab6%%. It is worth noting that the density gradient from top to bottom and around the circumference is uniform within +/- 0.02 g/cm³. This uniformity of density is significant because uniform density throughout the part minimizes distortion during sintering. Achieving higher sintered density is perhaps the primary method to improve the performance of a P/M part. 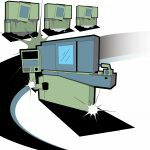 However, recent experimental work has shown that heat treat practice and secondary operations can also have a significant effect on actual part performance. 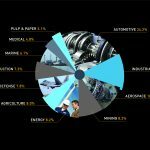 This section will review recent advancements in these processes and demonstrate how these advances can lead to improved gear performance. It is well known that carburizing produces favorable compressive stresses on the surface of components. This phenomenon applies to P/M components as well. Several researchers have found a 15% to 20% improvement in rotating bending fatigue properties. [11,12] In addition, the lower carbon core produces a material with greater impact toughness and core ductility. Despite the positive effect of carburizing on mechanical properties, one key material characteristic in which P/M falls short of wrought steels is in the area of rolling contact fatigue resistance. In rolling contact fatigue the high subsurface stresses resulting from the gear contact area and relative slip has shown the need for full density in the critical stress regions to withstand the Hertzian contact stress associated with rolling contact fatigue of high performance gears. Surface densification is a process that locally densifies the surface of a pressed and sintered P/M preform. 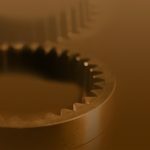 The concept of densifying only the surface is that maximum Hertzian stress in a gear is developed in the near surface region of the gear and diminishes with increasing distance from the surface. 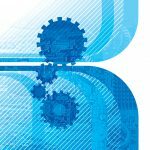 Thus, a gear with a surface densified case (to the appropriate depth) will give equivalent rolling contact fatigue properties to a wrought steel gear. Process development at Capstan Atlantic showed that the depth of the pore free densified layer can range from a minimum of 0.35-mm to greater than 0.70-mm. 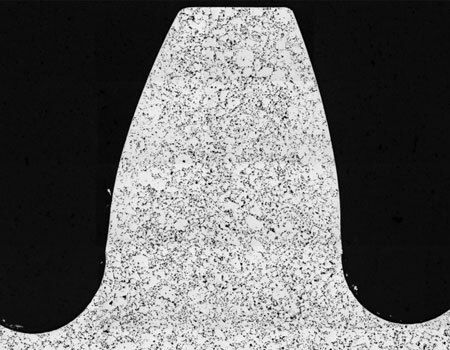 Figure 5 presents metallographic analysis of the porosity distribution for cylindrical test specimens that were densified via surface rolling to two distinct depths. Near full density was achieved at subsurface distances up to 0.75-mm (0.030-inch). Beyond the densified layer the porosity level increases to the level of the as sintered component. The data shown in Figure 5 demonstrates the versatility of the rolling process in producing densified layers but also the ability to densify to specific depths depending upon the requirements of the final application. 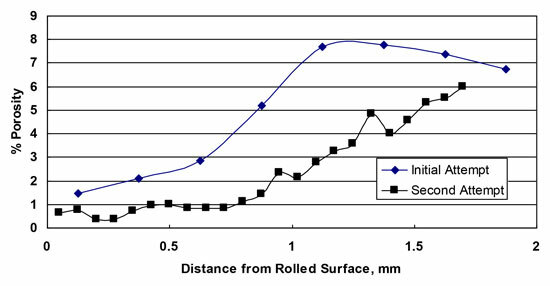 This densified layer produces improvements in the rolling contact fatigue results as shown by Sanderow. 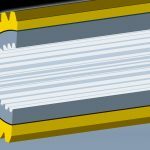 In addition to the benefits of improved rolling contact fatigue, the surface densification has the added benefit of improved gear geometry and the possibility of incorporating crowning on the surface of the gear. This section of the paper will describe the actual production of a surface densified helical gear shown in Figure 4. The intent of this section is to outline the steps necessary to achieve surface densification and the resultant gear geometries and densification profile. P/M is often considered a net shape process that requires little or no machining. 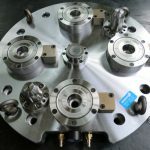 However, machining is sometimes required to incorporate undercuts, cross-holes, etc. 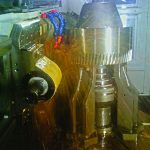 Machining is also used to improve the dimensional accuracy of some P/M components. Machining of P/M gears, unlike its wrought steel counterpart, is limited to the inside diameter. 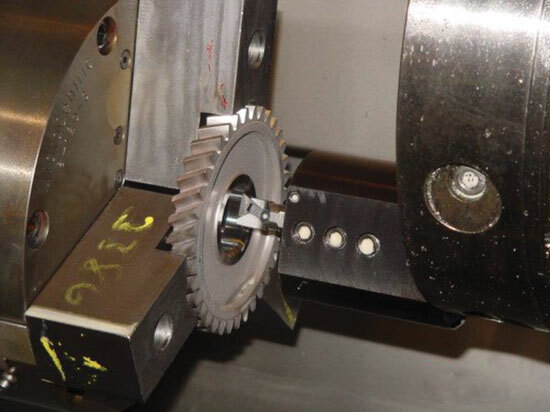 The benefits from this single machining operation are: precise inside diameter tolerances and near perfect alignment of the gear teeth to the central axis of the gear. Beyond the necessity to densify the surface and improve gear quality, another challenge presented by this application is the requirement of a “crown” central within the face width of the gear. First, looking at the lead traces, notice that the start and stop points of the trace are at the same level, while there is a positive crown in the middle of the trace. 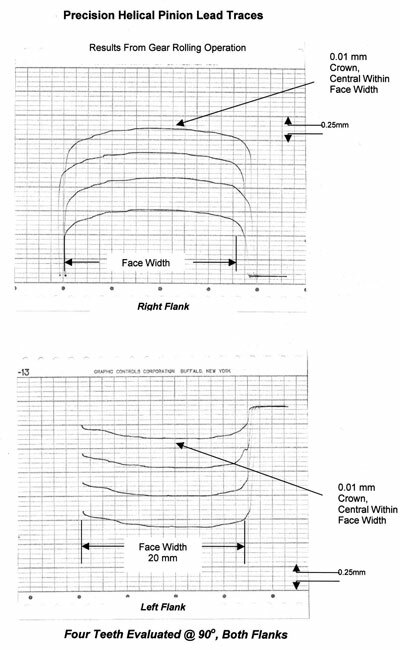 Typically with P/M we would see a hollow in the central region of the face width (Figure 2) of the tooth caused by the low dense region at or about the middle of the gear’s face width. We call this the “density dip” effect. The compaction of a high density gear perform with uniform density top to bottom, minimized this “density dip” thus in combination with a specifically engineered rolling process a 0.01mm crown was created, on both gear flanks. In addition to the dimensional and surface finish benefits realized by rolling, surface densification can also occur. 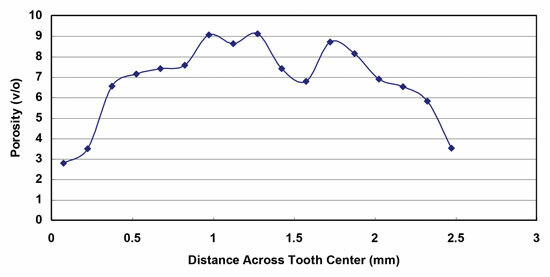 Typically, where required, gear tooth flanks are densified to a depth of 0.3 to 0.7 mm. The primary benefits of this surface densification are increased fatigue life by inducing compressive stresses on the tooth surfaces and wear resistance. Shown as Figure 10 is the photomicrograph of the surface densified helical gear. 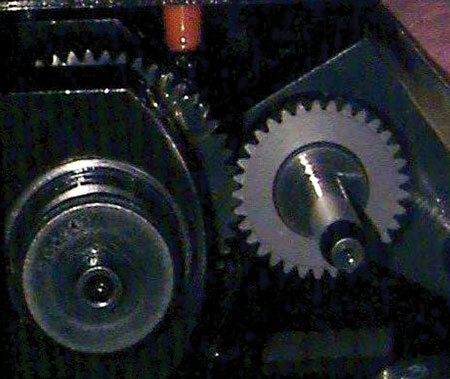 The gear was sectioned at a 22° angle to the vertical to show the uniformity of densification on the leading and trailing sides of the gear tooth. The first attempt at densifying the helical pinion produced a less dense case than what was developed on the toroidal test samples. The reasoning for the more porous case is simply, the conditions of rolling were not optimized. Prior experience at Capstan Atlantic has produced densified layers in gears equivalent to the test samples (data shown in Figure 5). What made this particular effort more challenging was incorporating the crowing on the gears. Rolling a P/M gear with a crown has not been attempted prior to this effort, thus the deformation behavior is not completely understood. Additional trials with rolling this gear form are certain to produce the desired densified layer and form detail. This processing offers the mechanical properties of a high-density part, the surface fatigue resistance of a wrought part, and potentially the low cost inherent to P/M processing. 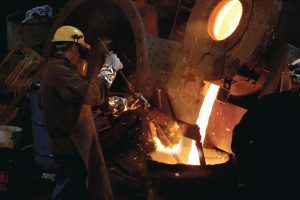 It is worth noting that the carburizing step develops a hard wear resistant surface layer plus produces desirable surface compressive stresses that give enhanced bending fatigue characteristics. Increases in the survival limit of rotating bending fatigue samples are on the order of 15% to 20%. Additionally, carburizing gives a desirable acicular martensitic microstructure in the case region. 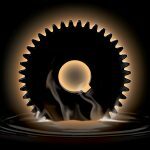 The synergistic effect of surface densification and carburizing offers the end user the potential for wrought steel gear performance with the low cost inherent with P/M processing. Finally, and perhaps most significantly, surface densification has the added benefit of producing a part with high dimensional precision. 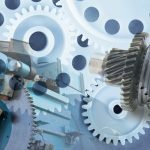 Lead and involute gear checking of the as rolled gear shows that the gear error is equivalent to a conventional machined wrought steel gear. 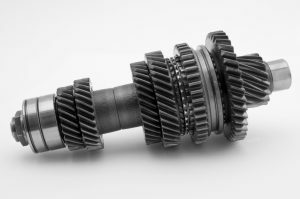 Additionally, the roll densification process was able to produce a crown on the gear that further enhances the NVH performance of the gear and surface endurance. 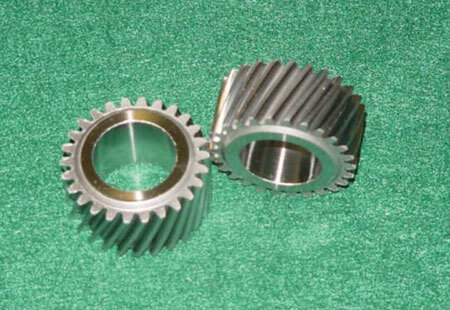 Gear crowning is impossible to achieve through P/M part compaction, the consistency of the crowning is a direct consequence of the uniformity of sintered density through out the part and expert engineering of the rolling process to produce this feature.  Don White, “State of the North American P/M Industry”, Advances in Powder Metallurgy and Particulate Materials, Part 8, pp. 1-1 – 1-12, Metal Powder Industries Federation, Princeton, NJ, 2002. Material Standards for P/M Structural Parts, 2000 Edition, MPIF Standard 35, Published by Metal Powders Industry Federation. R. Shivanath, R. Peters, P. Jones, E. El-Sawaf, “Vacuum Carburization of High-Performance Automotive PM Parts:, Industrial Heating, May 2001, pp. 37-39. Gear Design, Manufacturing and Inspection Manual, Published by the Society of Automotive Engineers, Warrendale, PA, 19096, 1990, p.51. I. W. Donaldson, et al, “Processing of Hybrid Alloys to High Densities:, Advances in Powder Metallurgy and Particulate Materials, Part 8, pp. 8-170 – 8-185, Metal Powder Industries Federation, Princeton, NJ, 2002. M. Marucci, M. Baran, and K. Narasimhan, “Properties of High Density Sinter-Hardening P/M Steels Processed Using an Advanced Binder System:”, Advances in Powder Metallurgy and Particulate Materials, Part 13, pp. 13-48 – 13-59, Metal Powder Industries Federation, Princeton, NJ, 2002. F. Semel and M. McDermott, “Recent Application of Binder Treatment Technology”, Advances in Powder Metallurgy and Particulate Materials, Volume 1, pp. 2-23 – 2-49, Metal Powder Industries Federation, Princeton, NJ, 2002. H. G. Rutz and F. G. Hanejko, “High Density Processing of High Performance Ferrous Materials, Advances in Powder Metallurgy and Particulate Materials-1994, Vol. 5, Metal Powders industries Federation, 1994, p. 117-133. H. Rutz, T. Murphy, and T. Cimino, The Effect of Microstructure on Fatigue Properties of High Density Ferrous P/M Materials, “Advances in Powder Metallurgy and Particulate Materials-1996, Vol. 5 pp. 135-155, Metal Powder Industries Federation, 1996.  K. Narasimhan, S. Polasik, and N. Chawla,” Surface Replication as Means of Monitoring Fatigue Crack Initiation and Propagation in Ferrous P/M Alloys”, Advances in Powder Metallurgy and Particulate Materials, Part 12, pp. 12-48 – 12-59, Metal Powder Industries Federation, Princeton, NJ, 2001.  S. Saritas, W. James, A. Lawley, “Fatigue Properties of Sintered Steels: A Critical Review”, Presented at the European Powder Metallurgy Association, October 2001. A. Taylor, F. Hanejko, A. Rawlings, “Advanced Sinter-Hardening Materials and Practices, ”Advances in Powder Metallurgy and Particulate Materials, Part 13, pp. 13-48 – 13-59, Metal Powder Industries Federation, Princeton, NJ, 2002.